Offering a full-scale study of the theory of reality hidden beneath modern logic, The Metaphysical Foundations of Logic, a lecture course given in 1928, illuminates the transitional phase in Heidegger's thought from the existential analysis of Being and Time to the overcoming of metaphysics in his later philosophy. 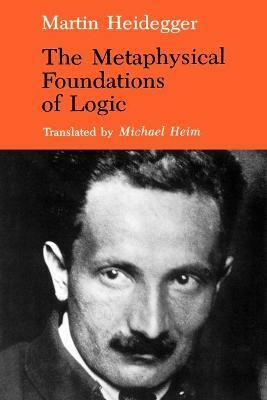 In a searching exposition of the metaphysical problems underpinning Leibniz's theory of logical judgment, Heidegger establishes that a given theory of logic is rooted in a certain conception of Being. He explores the significance of Western logic as a system-building technical tool and as a cultural phenomenon that is centuries old. In a searching exposition of the metaphysical problems underpinning Leibniz's theory of logical judgment, Heidegger establishes that a given theory of logic is rooted in a certain conception of Being. He explores the significance of Western logic as a system-building technical tool and as a cultural phenomenon that is centuries old. 9. The essence of truth and its essential relation to "ground"
Michael Heim is the author of Electric Language: A Philosophical Study of Word Processing.